Sunrise can be a beautiful time at the pier! Looks, whether for women, men, or piers, can be deceiving. When first built, the expectations for this pier were high. It was similar to the expectations about the Ocean Beach Pier in San Diego which was seen as sort of a second coming if you listened to the talk of the fishermen at the time. Poking out into the Point Loma kelp beds, anglers expected to haul in the same fish as the sportfishing boats—at a fraction of the cost. It never happened. Expectations were never quite THAT high at this pier but many anglers, including myself, certainly expected it to be a bonanza of a pier. So far, it hasn’t happened! Time has proven the pier to be excellent for crabs but generally only poor to fair for fishing unless you happen to visit when a school of pelagic species is present. Even so, the view is absolutely breath taking (when it isn’t raining or foggy) and it’s satisfying to simply cast out a line and contemplate the beauty of the angler’s world. 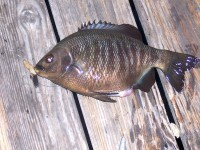 After all, catching a fish is only one aspect of pier fishing! Environment. This 900-foot-long (some sources say 720 foot-long) pier is located at the western end of the bay almost directly opposite from Citizen’s Dock, its sister (brother?) pier to the east. 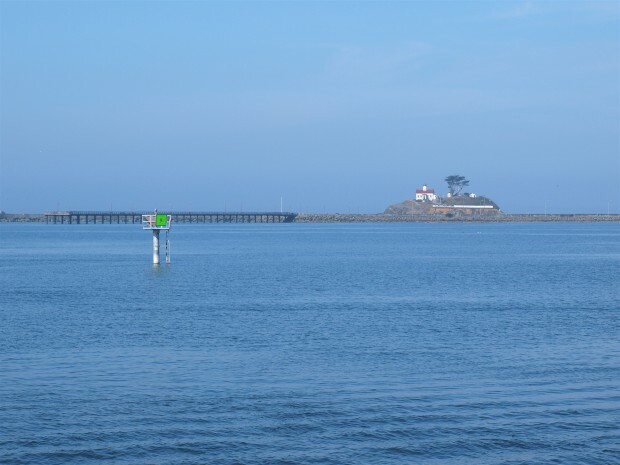 Nearby, to the west, sits the city’s jetty/breakwater (with its famous tetrapods) and the Battery Point Lighthouse. The bottom here is mud and sand, but the pier’s closeness to the breakwater, and several fairly good size rocks/small islands that sit near the pier, would seem to offer a combination of conditions ideal for both sand and rock seeking species. 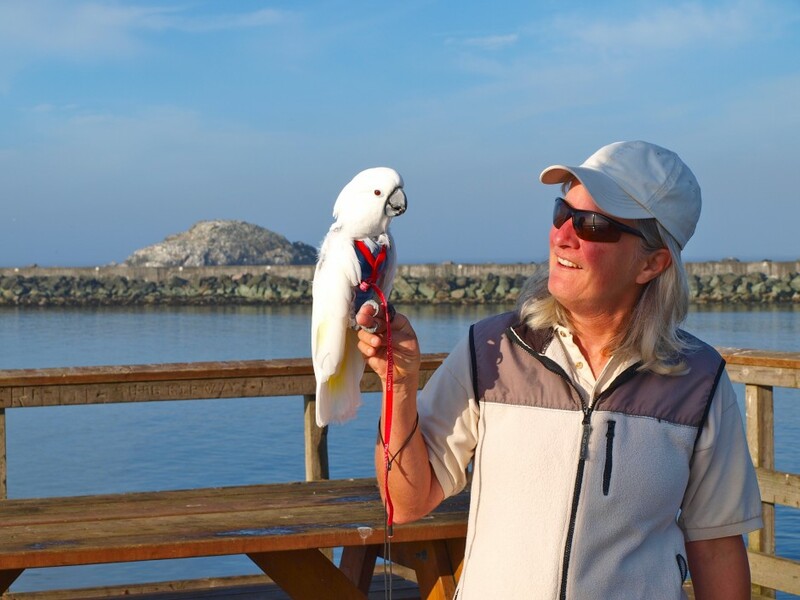 However, the rocky shore species such as greenling, cabezon and rockfish prefer the truly rocky areas (i.e., the jetty at Whalers Island) and the surf species, like redtail surfperch, generally prefer the nearby coastal beaches. 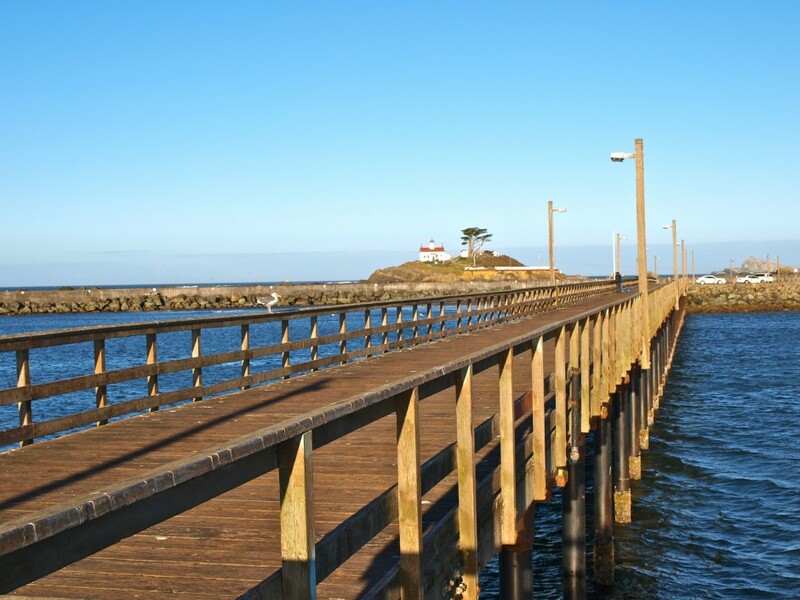 The pier does sit in a fairly straight line from the entrance to the bay and it does, at times, offer up good fishing for the transient schools of fish that enter the bay—the smaller surfperch, jacksmelt, herring, and, in warm water years, schools of jack mackerel. It can also offer the chance for salmon, especially when schools of baitfish such as anchovies are using the bay as home. On the bottom, it sees some flatfish as well as a few sharks, skates and rays. But overall, the fishing is fairly slow and inconsistent. Not so with the crabbing that is good much of the year. Most of the crabs are Dungeness crabs although a few red crabs also show up. Since Dungeness can only be kept legally for part of the year be sure to know your regulations (season, size and method of take). Unfortunately there just doesn’t seem to be a lot of attractants for fish. Even the pilings themselves are missing the mussels that help transform many piers into virtual artificial reefs. 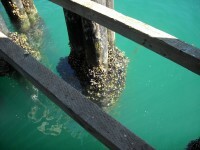 There are acorn and goose barnacles on the pilings but little else. What the pier seems to need is an artificial reef similar to those that have been installed at many piers to the south. One aspect that should not be overlooked is the weather. Yes, the city gets five and a half feet of rain each year but that’s generally during the winter months. And yes, although it rarely is cold, it is cool most of the year. But for anglers, wind can be as bad or worse than rain and this pier sees a lot of wind. The pier sits just a fairly short distance from the main jetty and the ocean and there is little to block the wind when it comes up. Unfortunately, that seems to occur many if not most afternoons and evenings and can affect the hours you want to fish. 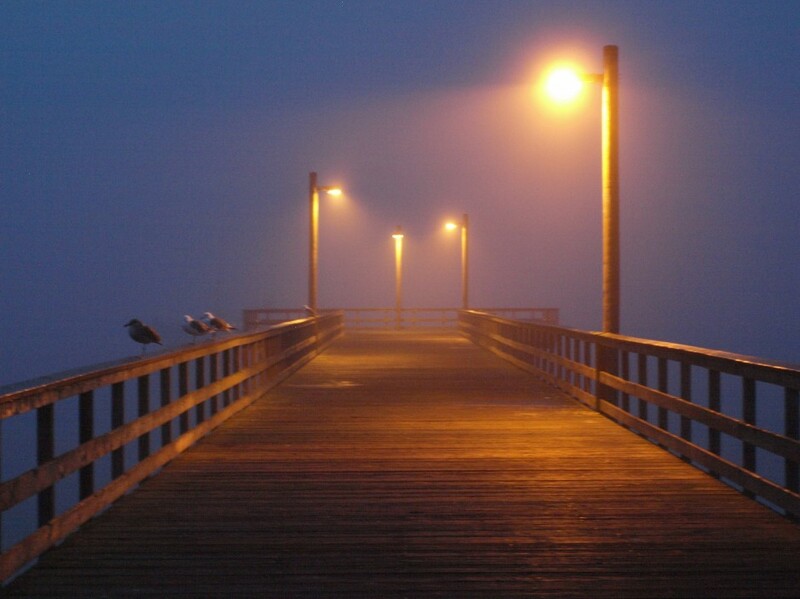 However, the early morn’ hours as well as night-time hours can be special at the pier; sometimes when the fog moves in there is almost an ethereal feeling to the pier. Just make sure you bring some warm clothing since the fog can seem to cut to the bone. My trips to Crescent City are usually preceded by a stay at Eureka and then a slow meandering journey north stopping at Trinidad, redwood parks, elk sightings, the Trees of Mystery, etc. The result is arrival mid-day. I then usually check into my motel and then I am off to fishing — usually stopping first at Citizens Dock. 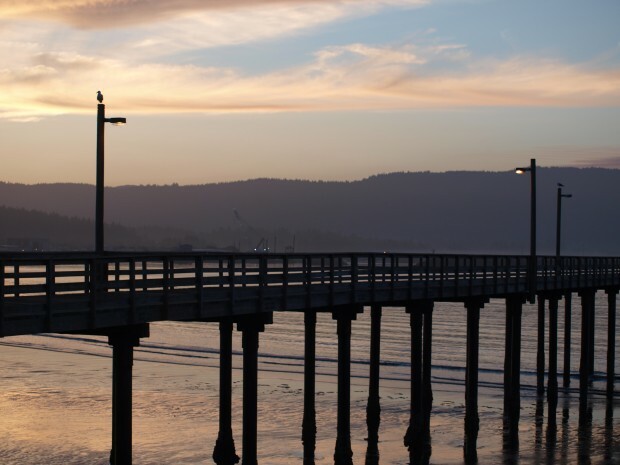 Often I have planned to fish at the B Street Pier during the evening in hopes of latching onto a big skate, a leopard shark, or a bat ray since the pier has the requisite sandy/muddy bottom for those species and they bite best during the evening hours. Often too I have given up due to the high winds and biting chill. Mornings are normally calm but the nighttime hours remind me of the Berkeley Pier at night (which often calls for arctic-like clothing). As example, a visit in 2015 saw me decide to walk out on the jetty prior to fishing at the pier. 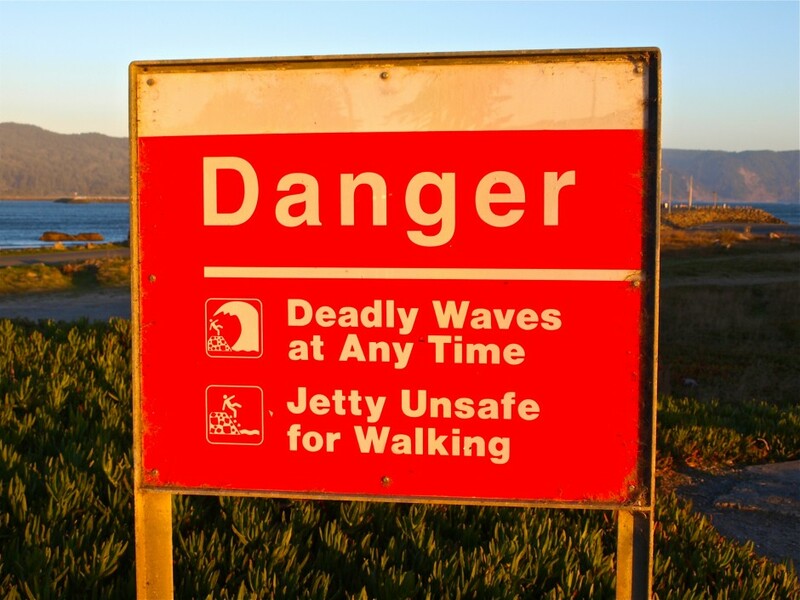 The jetty can be a dangerous place, which sign after sign proclaims. On a calm day it can be good for fishing but on a rough day the waves can be breaking over the top. This late afternoon visit saw waves breaking over the jetty at the end but it appeared safe to walk part way out. I was hoping to get some pictures of the pier from a different angle (which I did) but it was a costly visit. The wind was strong and the stinging sand was hard on the face; it reminded me of a visit to an acupuncturist more than twenty years ago. Luckily, I had a warm jacket and my “Wylies Malibu Bait Shop” hat but the hat was soon to be gone. I found out that I needed to lean into the wind and try to hold my hat but that didn’t work when I needed to take a picture and, as said, the hat became a victim of the wind (RIP old friend). When water started coming onto the jetty where I was standing, I decided it was time to move inshore. I’m sure if people had been watching it would have reminded them of the pictures of wind-blown reporters during a hurricane (and asking themselves how dumb is that?). Luckily, I always carry extra hats when I’m on my fishing trips. Given the ferocity of the wind, and the fact that my hands felt frozen, I decided that fishing would be impossible. Sometimes you have to punt! In this case I headed back to my motel and dreamed of what might have been. The next morning the wind had abated (somewhat) and the waters around the pier were calm. The bay was filled with anchovies, I caught some for live bait, and soon after caught a silver (coho) salmon. Looking back in my records, there were at least four times when I planned to fish the pier at night but gave up due to the wind. While doing research on the wharves of Crescent City, I ran across the following quote that seems as accurate today as then. “The peaceful quiet of cool twilight is broken only by the sad cry of the moaning dove and the lazy lapping of the waves along the beach. Then from far out at sea comes a faint sound like the distant roar of a multitude of voices; it increases in depth and volume with every instant and from the north-west there sweeps a wild blast that gathers up the sands of the beach and drives them whirling along the shore. The surface of the water quivers for an instant as though struck by a mighty hand, then sends a succession of swelling waves that gather strength as they approach and break open the land. Soon the whitecaps come rolling on from afar, running a race landward, bringing with them a flock of screaming gulls white as the foam itself, and whose erratic flight carries them through the hollow of the wave, and now vaulting upwards to the skies. There is a great commotion where the steep reefs extend out in the sea, for ponderous billows are rolling in upon them and crashing against their sides with tumult that is deafening. 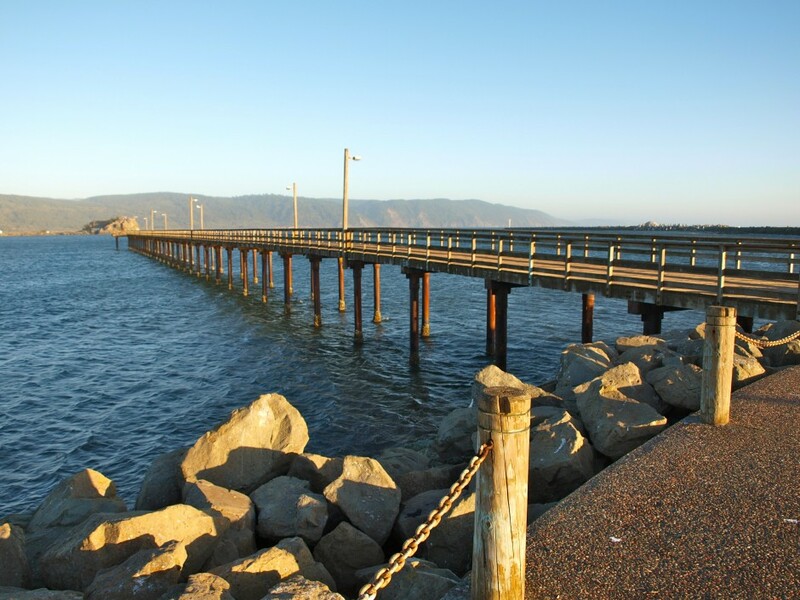 The pier does deserve its title as the ultima thule of California piers, the most northern pier in the state. Given that the state line with Oregon lies roughly 20 miles to the north, that fact should not be too surprising. Fishing Tips. The predominant fish much of the year will be small to medium-size perch such as silver surfperch and walleye surfperch, staghorn sculpin, and small flatfish. Small hooks (size 4-8) baited with pieces of sea worms, tube worms (if you can find them), shrimp, or clams take most of the fish. If schools are thick, you can try bait rigs like Sabikis (size 8-12), but they do not normally seem to take as many fish as at other piers. 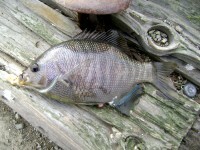 Redtail and calico surfperch may make an appearance, especially around May or June, and if they do the best bait will be sand crabs which you have dug up from nearby beaches. Next best baits would be pieces of shrimp, clams, or worms. A standard high/low leader with number 6 or 4 hooks will prove adequate for these perch. A few other perch species, especially white seaperch and striped seaperch may occasionally show up and the same baits and riggings will work with them. Jacksmelt and topsmelt have proven to be fairly common species and the typical rigging of 3-4 small size 8 hooks fished under a float of some type (bobber, piece of styrofoam, balloon, etc.) seems to be the standard gear. Most anglers use small pieces of market shrimp but I think pieces of sea worms make better bait. 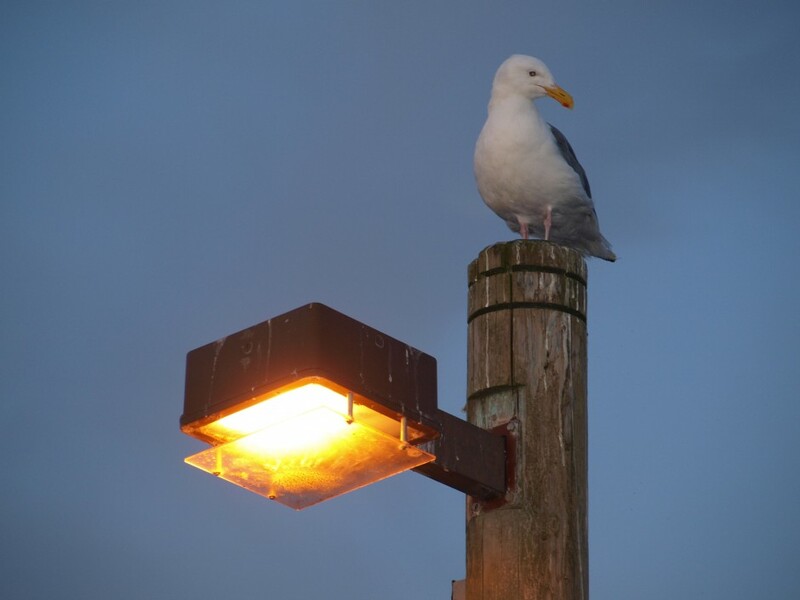 Although the large smelt may be caught whenever a school swings past the pier, the prime time often seems to be at night, just as it is getting dark. Since the darkness can make it hard to see your float, buy a bobber that is luminescent or buy a small hook-on glow light. 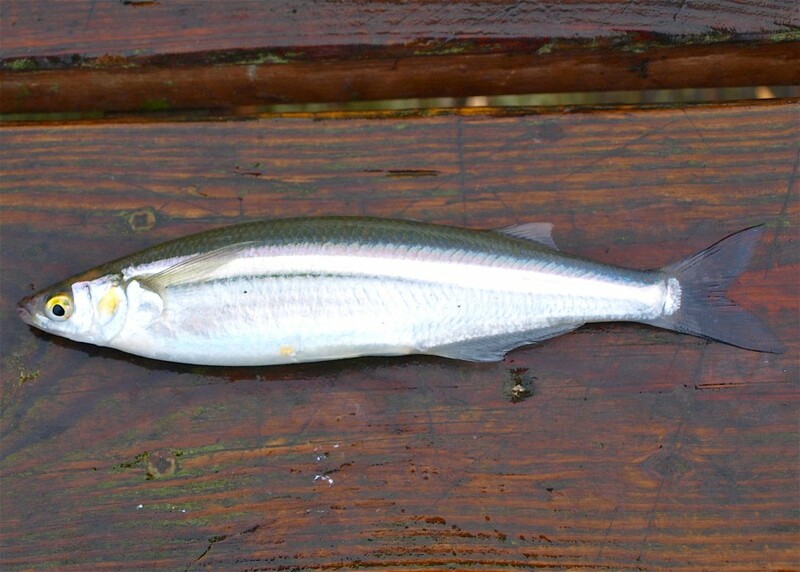 The smaller topsmelt are rarely large enough to eat but they do make good live bait. Flatfish have proven to be fairly common, something which was to be expected given the sand and mud bottom around the pier. Most prevalent are small speckled sanddabs that will latch on to bottom baits and hooks intended for larger fish. Unfortunately, most of these are really too small to keep for any useful purpose (although they might work as bait for a larger flatfish). Luckily, a few Pacific sanddabs and sand sole may also show up and they can be large enough to eat. Quite a few starry flounder also enter the bay and anglers with know how can catch a few of these tasty fish. Best rigging is a sliding leader rigging which offers no resistance when picked up by the flounder. Bait with a strip of anchovy, a piece or shrimp, clam, or tube worm. 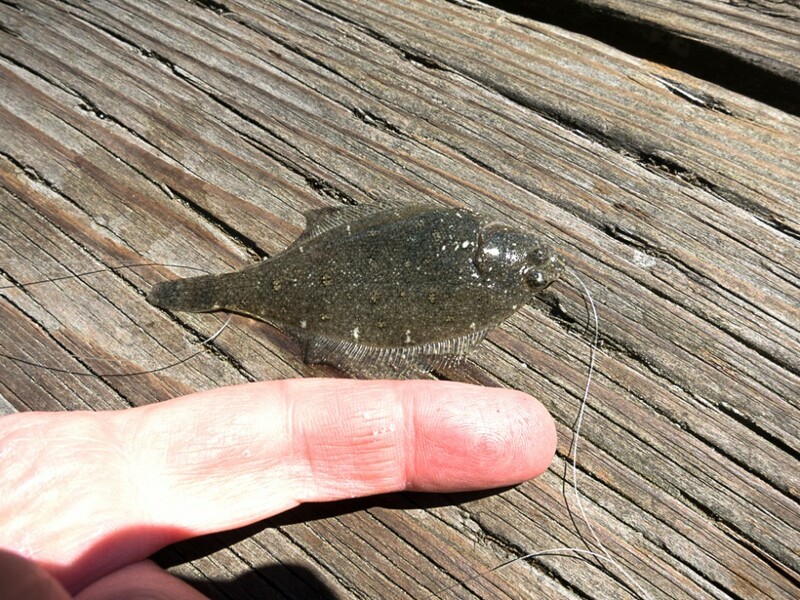 Although I haven’t seen any anglers use them here, I think live ghost shrimp would prove to be a sure fire bait for the bottom flatfish (as long as the crabs don’t get them first). You can’t buy ghost shrimp locally but I would think they would be available in the mud flats of the bay if locals acquired some ghost shrimp pumps. Halibut have proven to be the game fish ‘de jour for most of the pier anglers. Most years see a few California halibut landed with fish in the 24-30 inch size being recorded (and a 29-pounder was caught off the pier in 1997). I haven’t heard of any Pacific halibut being caught but some of the young of the species should enter the bay. For both of these species, a sliding leader baited with small live bait would be best. This generally means a live shinerperch, a smelt, or a small walleye or silver surfperch (and you might need to go over to the Citizen’s Dock to catch the bait). 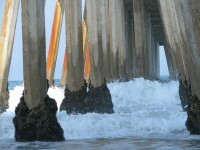 Sometimes schools of anchovies, smelt, herring or sardines may also swarm around the pier. Be sure you have some bait rigs with you so that you can snag some of the fish for live bait. Unusual has been the report of these halibut during the winter months (when the weather cooperates). 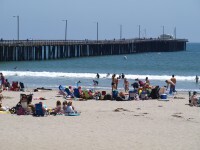 Whereas December runs of the fish have been reported at this pier, most California piers see May-July as the prime halibut months. 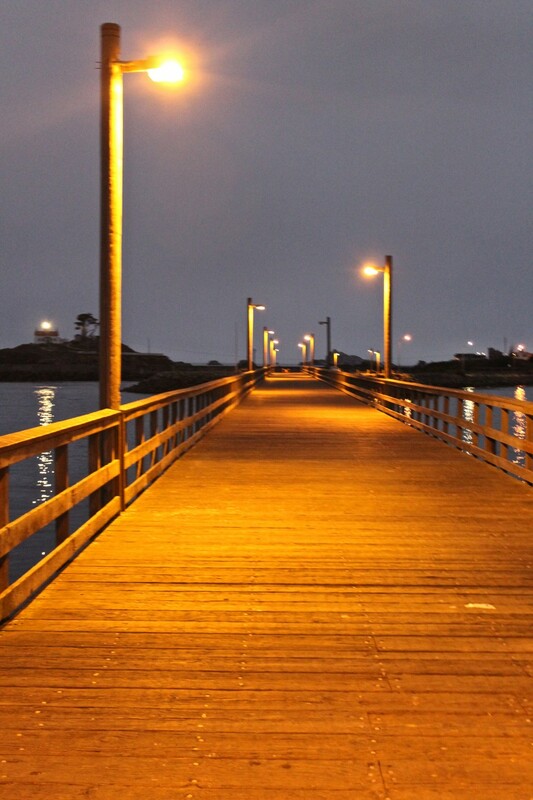 This pier has lights so it can be fished at night—if the winds cooperate. This should improve your chances for skates, bat rays, or sharks if you wish to fish for them—but few do. Most of the sharks are leopard sharks or dogfish (sand sharks) although the numbers tend to be fairly low (perhaps due to a lack of anglers). There was a good run on large leopards in July of ’09 and a report of a blue shark landed at the pier but the overall lack of sharks is still somewhat of a mystery. Use squid as the bait for the sharays since it will best survive the ravages of the crabs. 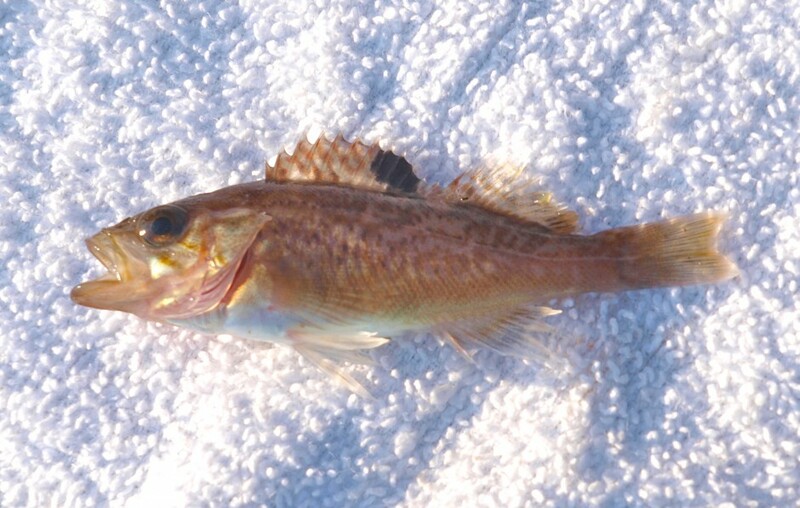 Small juvenile to mid-sized rockfish—black, blue, brown, yellowtail and copper—sometimes hang around the pilings during the summer months and, at times, you may see a school of Pacific tomcod or juvenile sablefish enter the bay. The numbers of these fish are small overall but they can provide a little variety and action for the anglers. Some years also see fairly good numbers of jack mackerel enter the bay and for some reason most of these are good-size fish, often exceeding two feet in length. Most are caught on Sabiki-type bait rigs and generally it is the late summer to fall months that see most of these pelagic critters. 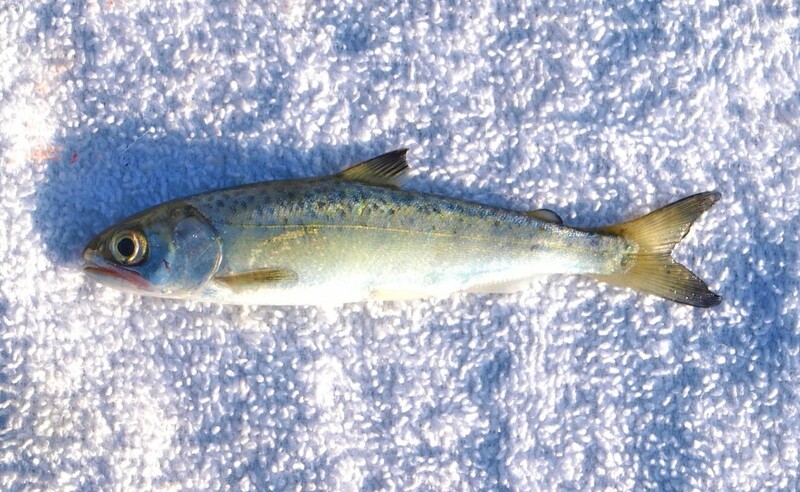 Not common but occasionally seen, especially during warm-water years, are Pacific mackerel. I think salmon are fairly common in the harbor but not too many really fish for them. 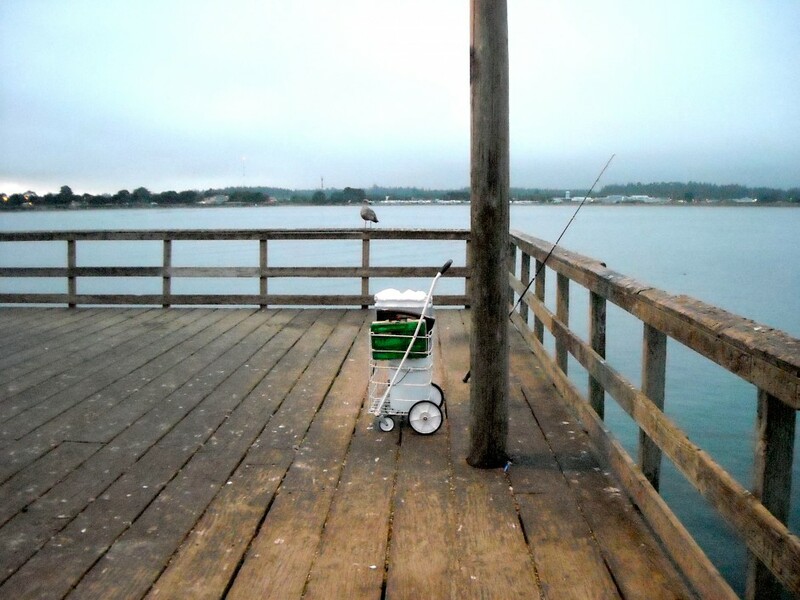 If more people used live baitfish, or tried artificial lures at the pier, more salmon would be landed. I landed several small, under-sized salmon smolt in 2013 while using my normal high/low rigging baited with pile worms. 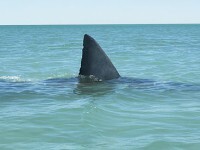 All of course were returned to the water but where there are small ones there should be larger ones. That thought proved true in 2015. Schools of anchovies surrounded the pier and eventually I broke out the Sabiki rig to catch some fresh bait. One lively anchovy was placed on a hook about four feet under a bobber. I wasn’t sure what I might catch but the result was a 23-inch silver salmon. Silver salmon are illegal to keep so it was returned to the water but it “made” my day on the pier. Do make sure that you know the rules governing salmon, especially those in regard to size, seasons, and types of hooks allowed. A highlight each year in the harbor is the arrival of Pacific herring. 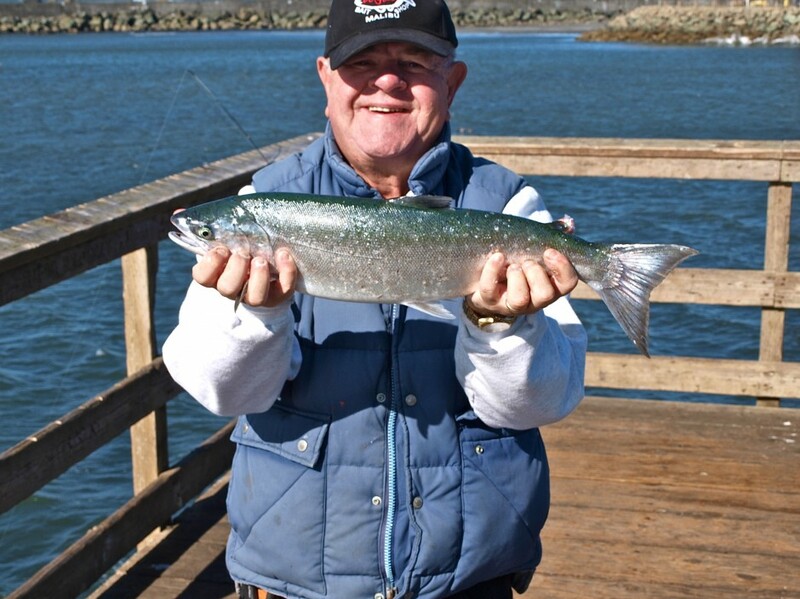 Anglers will flock to the Coast Guard Jetty, Citizens Dock and even the B Street Pier for the tasty fish. Although the jetty seems the “primo” spot in the harbor, and will be filled with people using Sabiki-type bait rigs or nets, both piers can also be productive. The advantage of the piers is, of course, the fact that no license is required. One day I was fishing for herring off the jetty when approached by a couple of anglers from Oregon. Was this a good spot? Yes. Did you need a license? Yes on the jetty but not on the public piers. 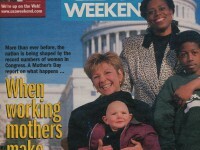 They moved to Citizens Dock (which unfortunately wasn’t as productive that year as the jetty). The herring generally run from January to February (but the runs can start earlier and end later) and the best times are usually during high tides so check the papers. Most people use bait rigs and dress with rain clothing since rain is to be expected that time of the year. People will fill their coolers with the fish, some to be eaten and some to be saved as bait during the salmon season. One fish that is common, in fact far too common, is small staghorn sculpins. Sometimes the bottom seems to be covered with the “bullheads” and they’ll grab baits seemingly far too big for their mouths. 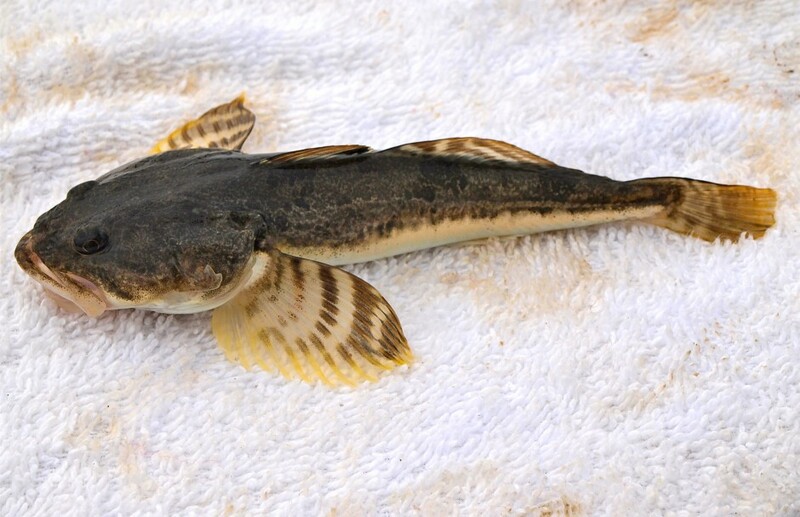 They are too small to eat but can make decent live bait if fished slightly above the bottom. If allowed to rest on the bottom (when using a Carolina rig) they will sometimes burrow into the bottom mud which makes them a little hard to spot by the fish being sought. But, it can be hard to keep them off your hook. Be prepared to share space with the crabbers. As mentioned, this pier has proven to be a top-notch spot for crabs and at times this can be to the detriment of anglers actually fishing for fish. 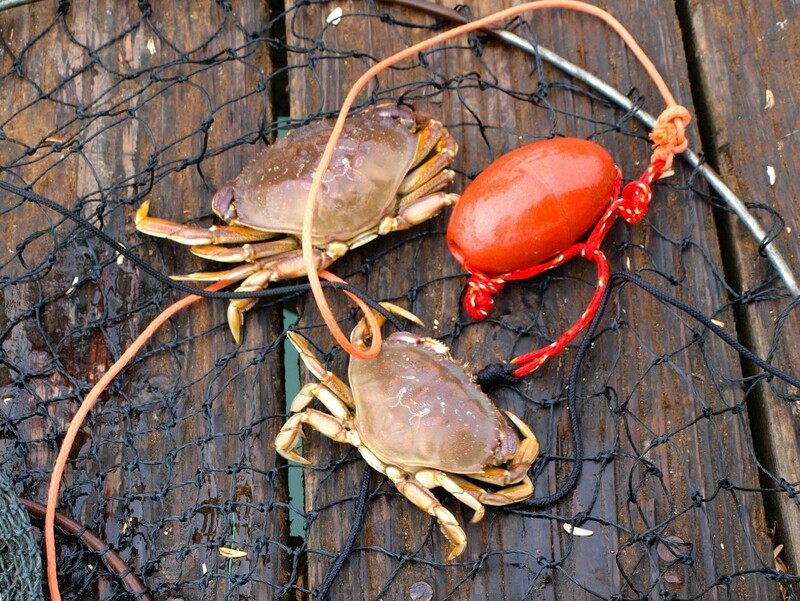 Crabs like to gobble up the bait while crabbers gobble up the railing space. One night I visited the pier for a little potpourri fishing and was startled to see crab pots tied every 7-10 feet around the entire end of the pier, in fact the outer 1/3 of the pier. There must have been at least 50-60 crab pots out there and if you wanted to fish a spot you had to do so amidst the pots and the ropes to the pots as well as the families that were crabbing and having a little social gathering. Every few minutes a pot would be pulled in and then tossed back out (generally as far as the person could throw it); it was a loud and disturbing racket which didn’t help the fishing and I blamed my lack of success at least in part to the din of the crabbers. But, they were catching crabs and certainly had as much right to the pier as I did. 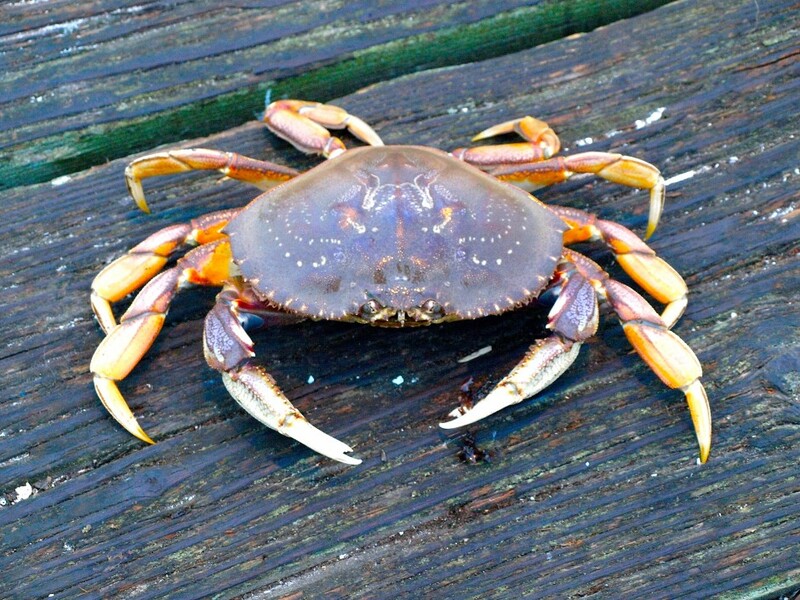 The Dungeness crab season is generally the first Saturday in November through July 30 and during that period you will find crabbers out most nights—especially if the wind and weather cooperate. Interesting is that quite a few of the crabbers are from Oregon. 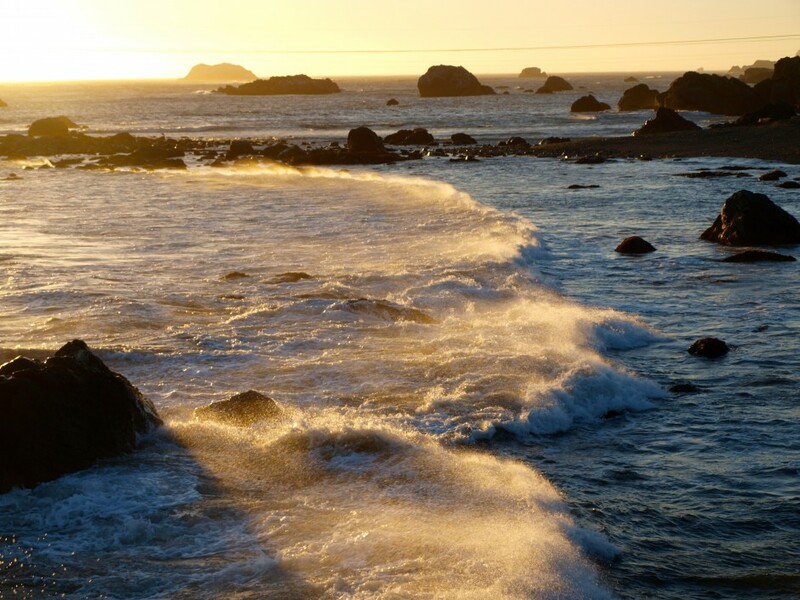 especially Brookings, Oregon, that sits just 26 miles to the north. The combination of no license requirements along with the perception that the Crescent City crabs are of superior quality attracts quite a few people across the border. The result can be the crowded conditions mentioned above and I wonder if certain sections couldn’t be reserved for the crabbers and others for fishermen, at least for those months? Crabbed the B Street Pier in Crescent City Monday and Tuesday. Got two legal rocks, one red, and one Dungeness. First time I’ve crabbed in thirty some years. Tuesday (Nov 28) was real slow until about and hour before low tide. Then we were getting 12+ crabs to a ring, some nearly legal. Fished both days without a bite. Are those fat sea lions in the harbor doing a job on the fish inhabitants? 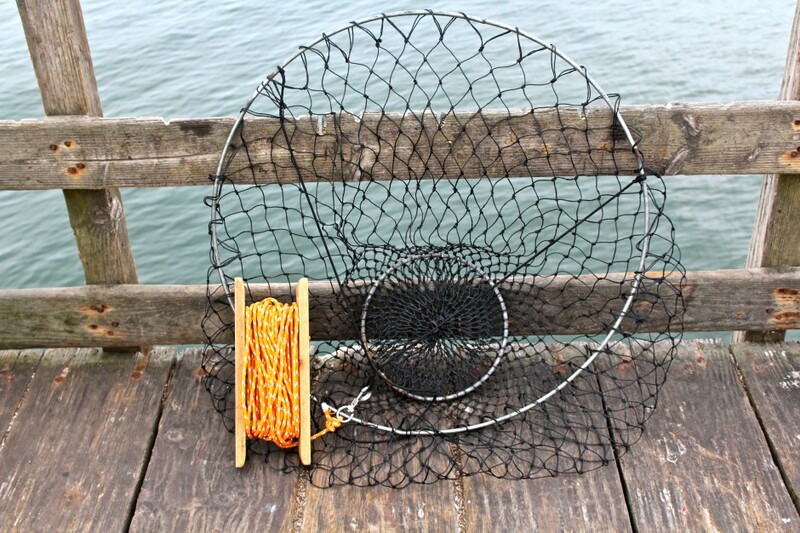 Buying and reading ‘Pier Fishing in California’ renewed my interest in fishing and crabbing. Thanks Ken!! Got back last night. 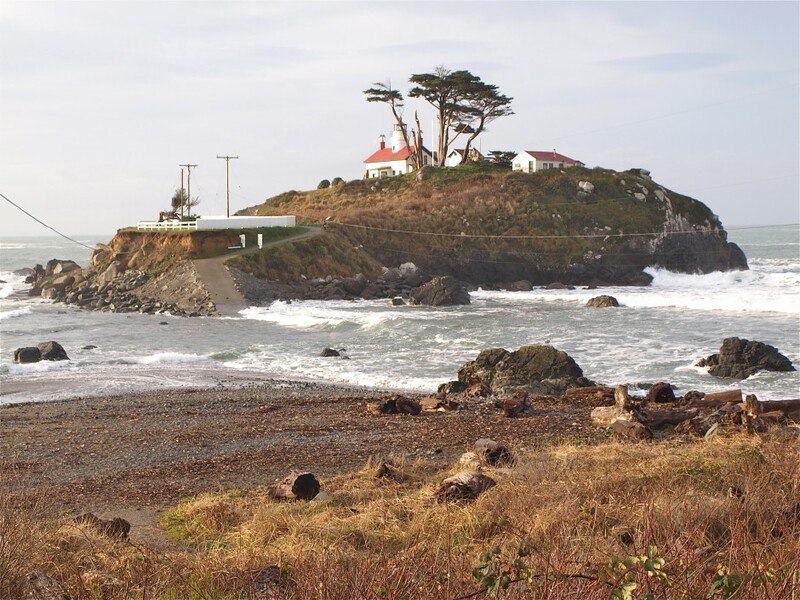 I hoped to get to Anacortes, Wash in the San Juan’s but got tired of driving up I-5 so made a right turn to Winchester Bay, Oregon. Dug a batch of soft shell clams and steamed them for dinner. Drove down to Coos Bay the next day and dug some more soft shells. Made some good oil and garlic over linguini with lots of fresh clams. Excellent!! 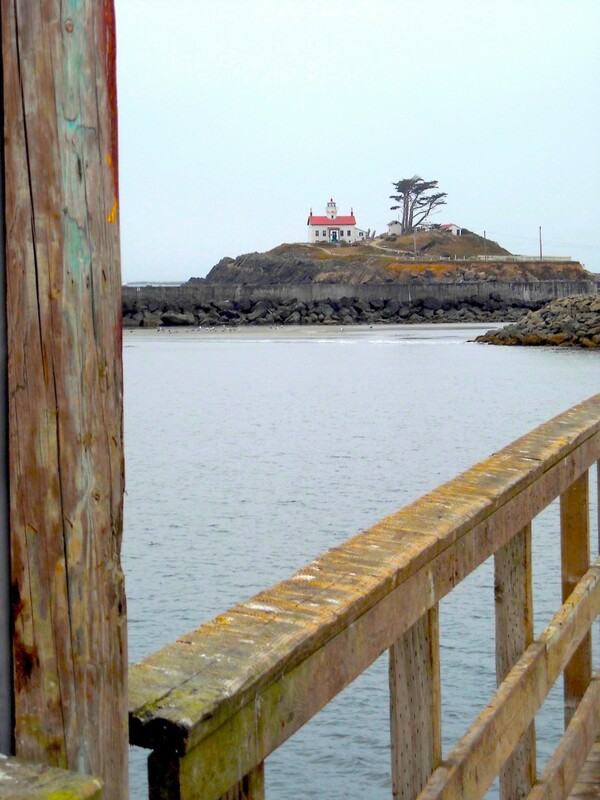 Next day, I drove down the coast to Crescent City, CA for some fishing off the pier. The bay was loaded with anchovies as far as you could see in any direction. Billions of them. A million birds were feasting on them, seals were in all their glory and a huge grey whale was in the bay eating his share. What a sight. The bay was black with them. I didn’t have a bait pole so I told a young Asian boy that was using a Sabiki rig that if he supplied me with live bait, I would give him 50% of my catch. He obliged and I sent a live ‘chovie down on a sliding leader. I had a hook up of something in about one minute. It spit the hook and soon afterwards the wind started to howl at about 30 knots so I called it a day. Tuesday 8/12—“B” St. Pier: I decided to head over to the ”B” St. Pier that sits at the other end of Crescent Harbor; a pier that has always disappointed. Here the bottom is sand and mud and typically the choice is schooling fish on the top (jacksmelt, walleye surfperch, silver surfperch, Pacific herring, etc.) or a bottom fish—sole and flounder during the day, a possible skate or shark at night. The big rig was cast out for a bottom fish while the light rig was set up with a high low and pile worms for perch by the pilings. The perch were missing but some small kelp greenling were present by the pilings; unfortunately, so too were the juvenile black rockfish. As for the heavier rig? All it was attracting was crabs and they were doing quite a job on the baits—anchovies, cut mackerel, and finally squid. I did put a live shinerperch out for halibut but even that wound up being attacked by the crabs. I finally decided to call it quits. It seemed that small hooks yielded unwanted small fish (the black rockfish), large hooks yielded crabs. 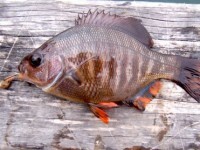 “B” St. Pier: 7:35-9:05 PM — Fish Totals: 12 Black Rockfish (juvenile), 5 Kelp Greenling, 1 Shinerperch, 1 Staghorn Sculpin, 1 Very Large Rock Crab. All fish released. Day 4—Monday: Tired and a little hungry I finally decided on a break before heading out to the “B” Street Pier. However, by the time I reached the pier the wind was REALLY blowing as in it was almost hard to stand up straight. No one was on the pier and I hated NOT being able to fish a few more hours but it just seemed fruitless. A few more pictures and I called it a day. Day 5—Tuesday: I was scheduled to meet up with a friend at Trinidad at 1 PM but wanted to fish “B” Street for a few hours, and Citizens Dock one more time. Thus I was out at the pier at sunrise and got what I feel were some nice pictures. No wind, little current, but few fish. This has always been one of my most disappointing piers. 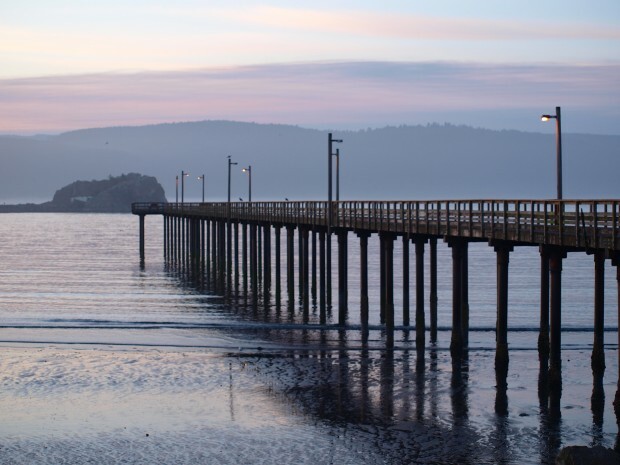 It’s a beautiful pier, in a beautiful setting, but totally surrounded by a mud bottom. The big perch have never shown an affinity for the pilings, the flatfish are few and far between, and you’re at the mercy of pelagics passing by the pier. It’s almost always good for crabs but I wasn’t crabbing. I’ve thought for years they should build an artificial reef by the pier and the feelings haven’t changed. Other than a few juvenile yellowtail rockfish nothing really showed with the exception of a couple of salmon smolt that had the audacity to hit my pile worms. Bullheads (staghorn sculpin) of course were present as they were throughout the trip (giving rise to the title—“Bullhead Trip”). 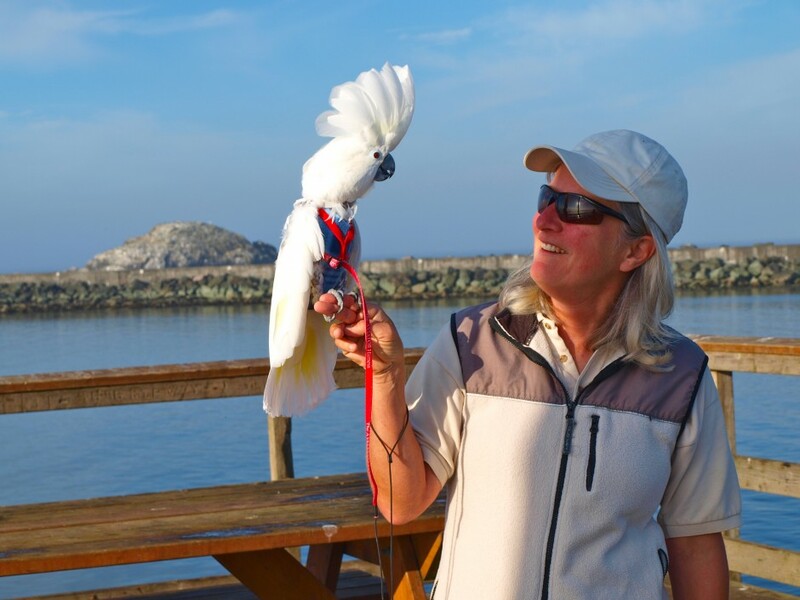 It was an interesting visit however between the beautiful dawn and a lady who brought out her parrot to the pier. We had a nice talk and it added something different to an otherwise slow fishing trip. Salmon were hanging around under the end of B Street Pier in Crescent City this afternoon. They wouldn’t take my bait; all I had was shrimp and Fishbites. No other fishermen were on the pier at the time. Wow, better outfit yourself with some pink Mad River steelhead worms and go get yourself some orange meat! Chartreuse spinners or spoon. When all else fails salmon will still eat chartreuse. I fished the “B” St. Pier in Crescent City Saturday morning for a couple of hours and was getting nothing on the bottom except bullheads and crabs when I spotted some anchovies. 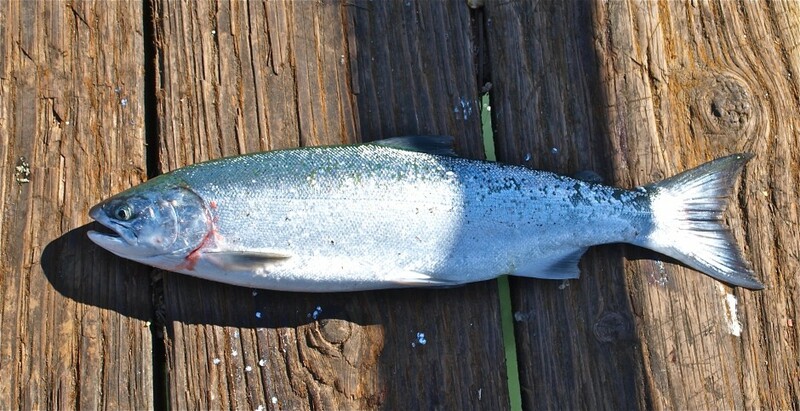 I caught a few with a Sabiki, put one on for live bait, and got a surprise, a 23-inch silver (Coho) salmon. I didn’t expect that. I was going to fish the pier Friday night but the winds were ferocious, 30-40 miles per hour with gusts topping fifty. I walked out on the jetty to take a few pictures of the pier, lost my hat to the wind, could hardly stand up, and decided it would be futile to go fishing in that wind. The next morning it was still windy, which made it difficult to fish, but I decided I had to at least try it for a couple of hours. It proved to be a wise decision given the salmon. Of course being a silver salmon it was illegal and had to go back into the water. September 1997—William Van Dyke, of Popeye’s Bait & Tackle at the foot of the pier, says there has been a good run of mackerel, Pacific herring and jacksmelt at the pier. Anglers are using bait rigs or very small hooks and beads to attract and hook the fish. Some of the mackerel are up to 3-feet in length which leads me to suspect they are jack mackerel (Spanish mackerel), although this El Niño year may see Pacific mackerel up in that area. Fishing for both halibut and perch has slowed. December 1997—Linda, at Popeye’s Bait & Tackle, says it has been windy, cold and rainy and few if any fish have been landed recently. However, in the first three hours of the new Dungeness crab season, eight people on the pier landed their limits, so it looks like another banner year for Dungeness crabs. 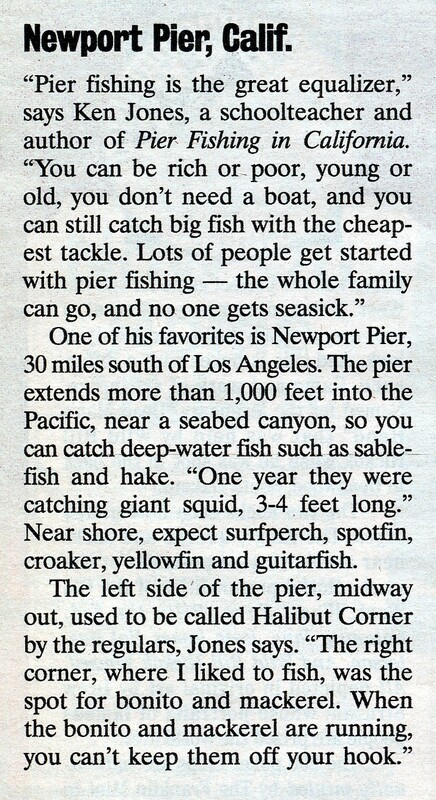 January 2000—Chris, at Englund Marine, says that he is getting reports of quite a few halibut being landed at the pier. Six fish, 15-20 inches long, were landed one day and another two fish broke the lines of the anglers. He says it is a possibility they are sand sole but all reports so far indicate they are California halibut even though it’s a strange time of the year for them. Most action though is being done by the crabbers who are out in force. The weather has been pretty good for this time of the year. March 2001—Dave, at Englund Marine, says that anglers are beginning to pick up quite a few pogies/pumpkinseeds at the “B” Street Pier and at Citizens Dock. Unfortunately, I’m not too clear as to if they are pileperch, striped seaperch or redtail surfperch, but at least some type of perch are cooperating with the local anglers. He says anglers are also snagging some herring when the schools make their runs into the bay and that people are getting a few Dungeness crabs (although overall it has been a slow crab season). August 2001—Leonard, at Eugland Marine, says salmon action has been fantastic off the shoreline and that a few are also being landed from the piers and wharfs. He says there is bait everywhere—jacksmelt and Spanish mackerel. He says the salmon are being taken on 1/2 to 1 oz. Kastmasters, Little Cleos and Krocodiles. September 2001—Leonard, at Eugland Marine, says visitors hitting the pier are getting a few fish—smelt, herring and flatfish. He says there’s been a massive die off of fish in the harbor and the smell is somewhat overpowering. February 2002—Chris at Englund Marine, at the foot of Citizen’s Dock says a couple of California halibut were landed recently along with some small sand sole. Crabbing has been poor. Again however, the runs of Pacific herring should start anytime. September 2002—Chris, at Eugland Marine, says anglers are mainly getting some nice sand sole (which they mistake for halibut) and a few perch. Quite a few octopus are also being taken. October 2004—The pier is seeing occasional flurries of jacksmelt along with the regular perch (walleyes, silvers and a few redtails). Some sand sole are also available. Most of the action continues to come from crabbers. 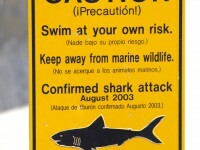 August 2006—Leonard, at Eungland Marine, reports that more people are crabbing than are fishing although a couple of good-sized leopard sharks were taken from the pier. Author’s Note. No. 1. For years there was a small bait and tackle shop (actually a trailer) near the front of the pier. And, for a period of time, I received fishing reports from the shop (see below). For whatever reason the shop is now gone but it sure would be nice if a shop were out there. 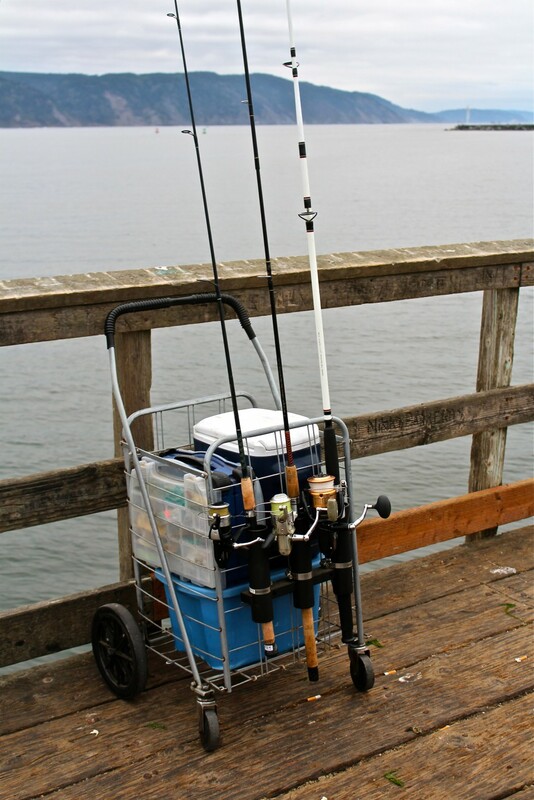 Not only would it provide bait for anglers (which can be hard to find along the north coast) but if done correctly could provide some snacks and drinks for the tourists who seem to love to walk to the end of the pier. Author’s Note. No. 2. The Battery Point Lighthouse sits just inshore from the pier and it and its museum are well worth a visit. However, you will need to do it at low tide. The lighthouse sits on a tiny islet connected to Battery Point by an isthmus and is surrounded (at times) by water. 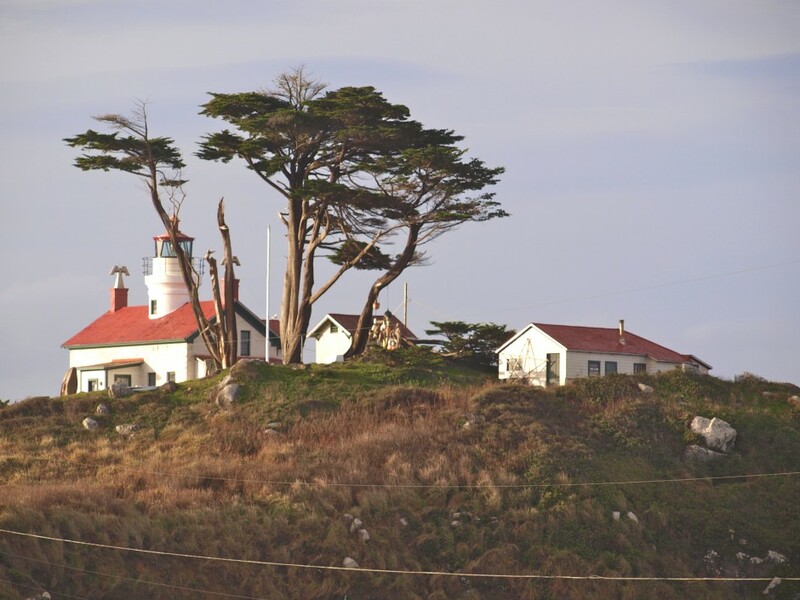 It was commissioned in 1852, lit in 1856, and is one of the oldest lighthouses on the West Coast. 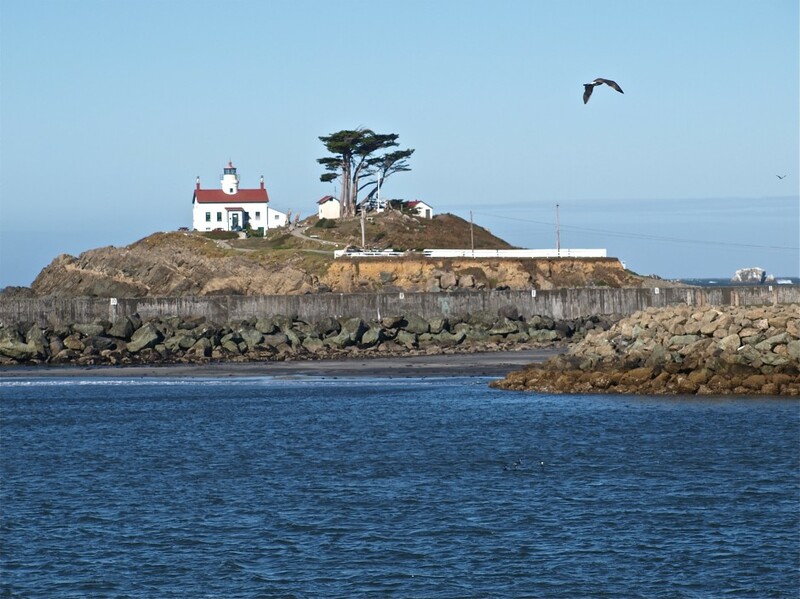 It was finally automated in 1953 and then, although it survived the 1964 tsunami that devastated Crescent City, its light was replaced in 1965 by the flashing light that sits at the end of the nearby breakwater/jetty. Do remember to leave the lighthouse before the high tide returns. Author’s Note. No. 3. 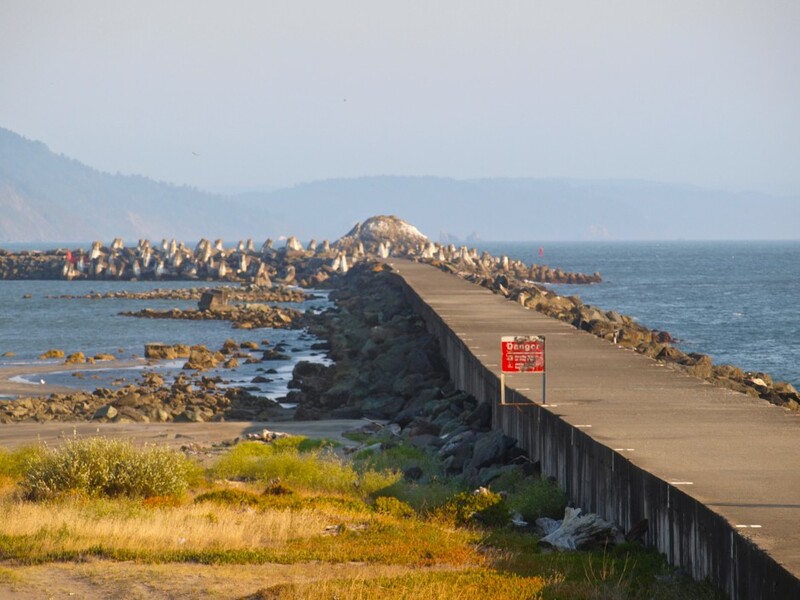 The Crescent City Breakwater/Jetty sits just to the west of the pier and gives protection to it and the harbor itself. Signs warn of the dangers of walking on the jetty but many people do. Be careful out there! 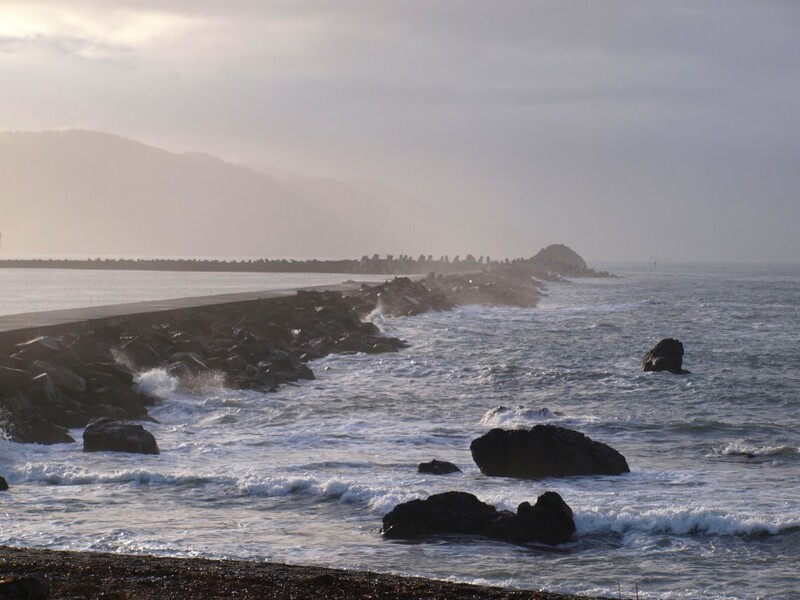 Rogue waves that can sweep over the jetty are a common occurrence. Out toward the end of the jetty are the famous tetrapods that were installed following the 1964 tsunami. Author’s Note. No. 4. 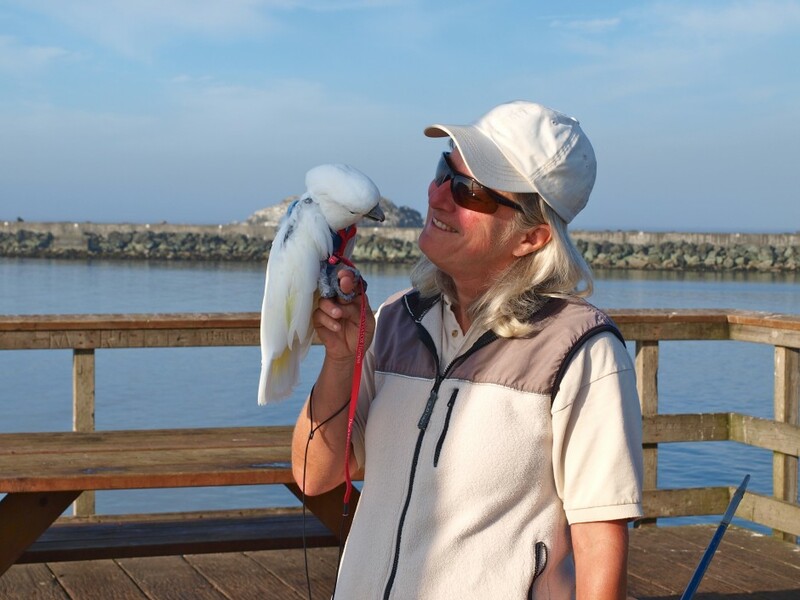 You never know what you are going to see on a pier. One morning saw me joined by a lady out walking her cockatoo and we had a very interesting talk, one that almost made me want to go out and buy a cockatoo. 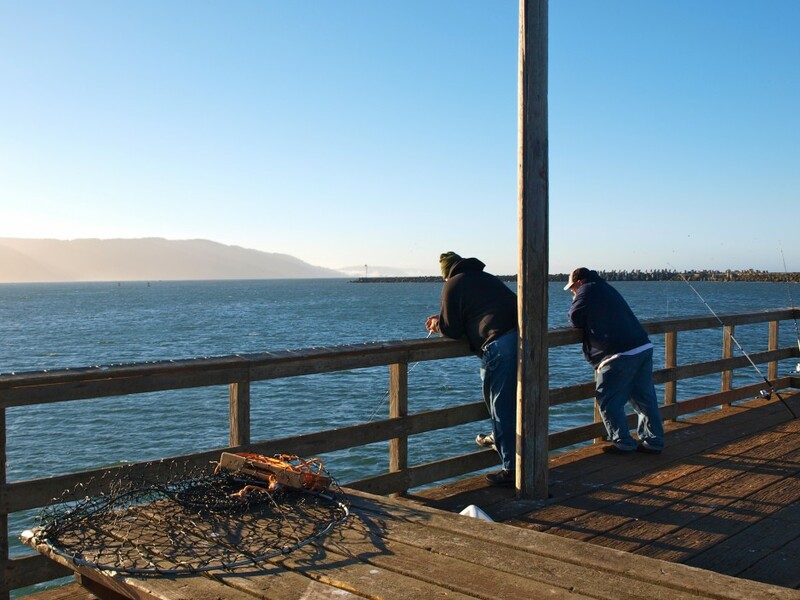 Now, with all the legal wrangling over, it was time to act on the new B Street fishing pier. A spokesman for the Corps of Engineers commented that someone in Crescent City “stretched it a bit far” by torching the old Dutton wharf before the needed permits were issued. 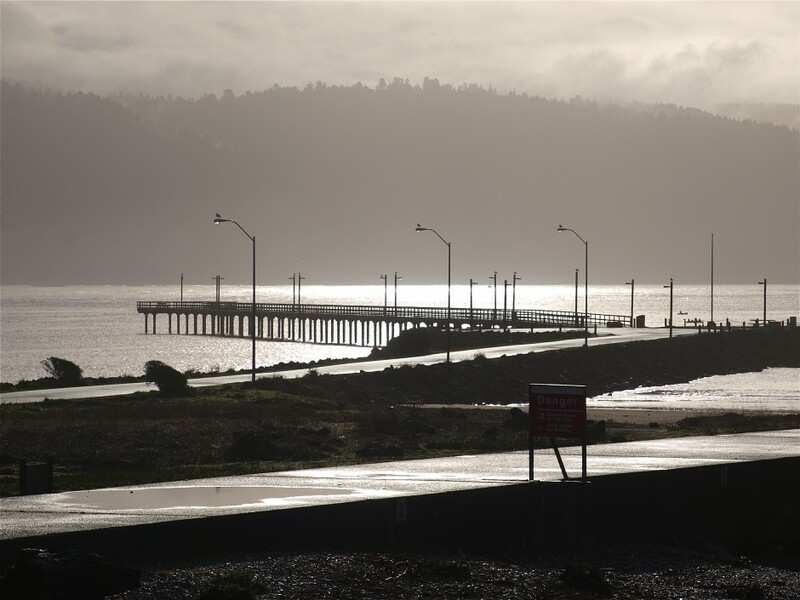 The city now needed to write a plan for the burn, including plans for debris removal and pile control to keep the harbor open to boats and ships. 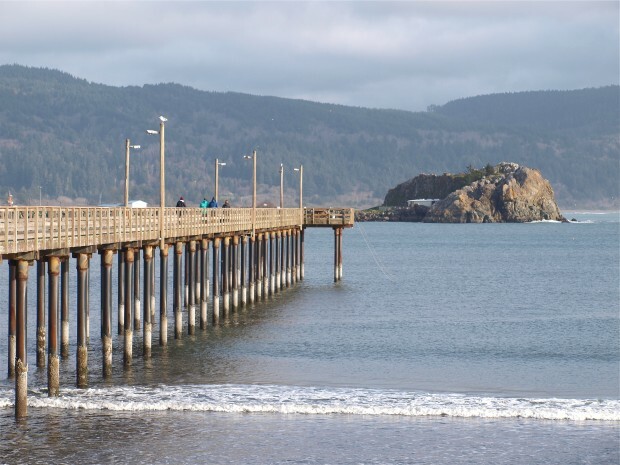 On August 27, 1987, the same day that three Crescent City officials were indicted, the California Coastal Commission agreed to give Crescent City a permit to demolish the old Dutton pier. Ninety percent of the wharf surface had been destroyed by fire. 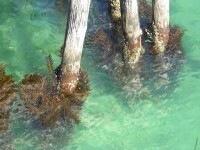 The permit was for the remaining 10 percent of the wharf’s surface and the pilings. The city then had to wait for authorization from the Corps of Engineers to remove the remaining wharf surface and the pilings. 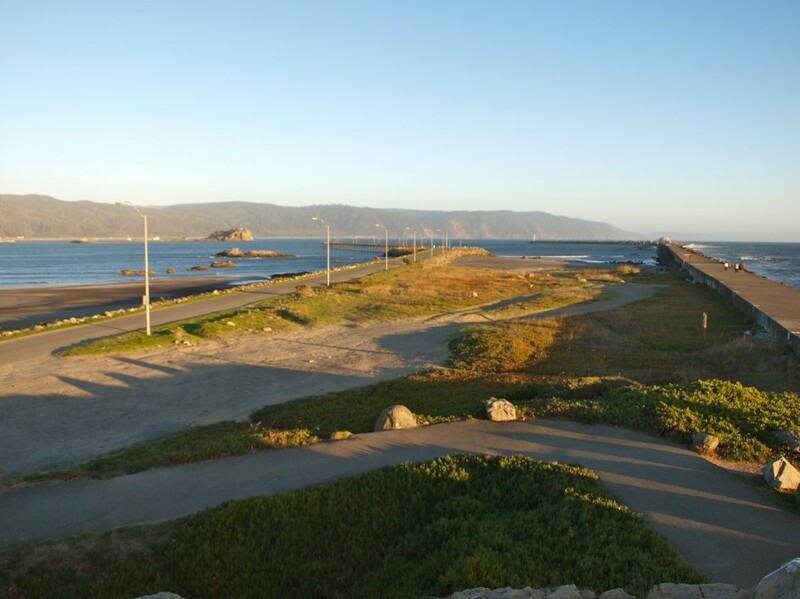 The Corps permit was received in September and arrangements were made for the California National Guard from Eureka and Crescent City to perform the demolition of the old Dutton Wharf. In August, 1988 the City Council unanimously agreed to name the new $1.5 million pier to be built to replace the old Dutton wharf the Michael J. Scavuzzo Public Fishing Pier. It was named after Scavuzzo because of his commitment and perseverance to the redevelopment of Crescent City, especially the waterfront planning. On Saturday September 17, 1988 members of the 579th Engineer Battalion began demolition work. Over the weekend about 200 feet of the old pier were pulled and blasted off its foundation. In all there were 25 to 30 guard members, four divers, and two blasters who participated in the works. The work went slowly because they had to avoid disturbing the fish in the harbor. Each pier had individual charges set by National Guard divers underwater. Blasting caps had to be detonated just before each blast to scare the fish away from the charge area. The operation used 700 pounds of explosives and about 6,000 feet of cable for the charges, which were detonated from shore. 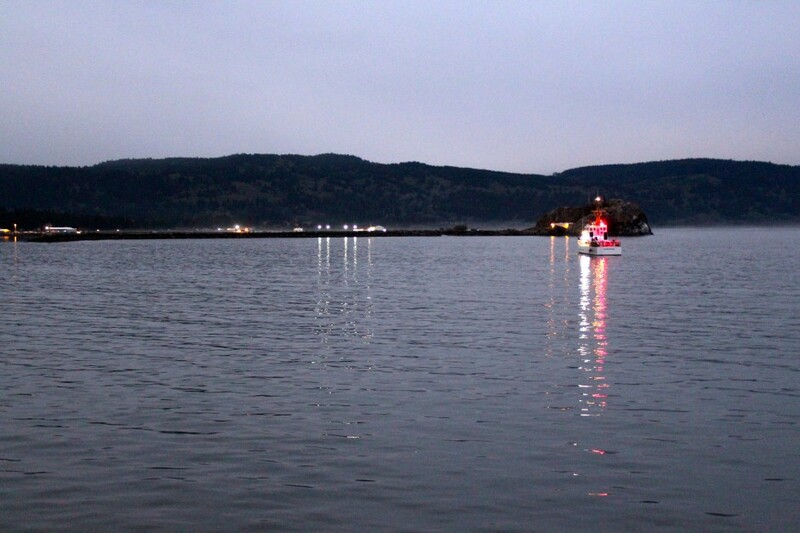 A guard bulldozer pulled about 50 feet of the pier from its mooring on the land side. All of the pilings on the sea side had to be blasted. 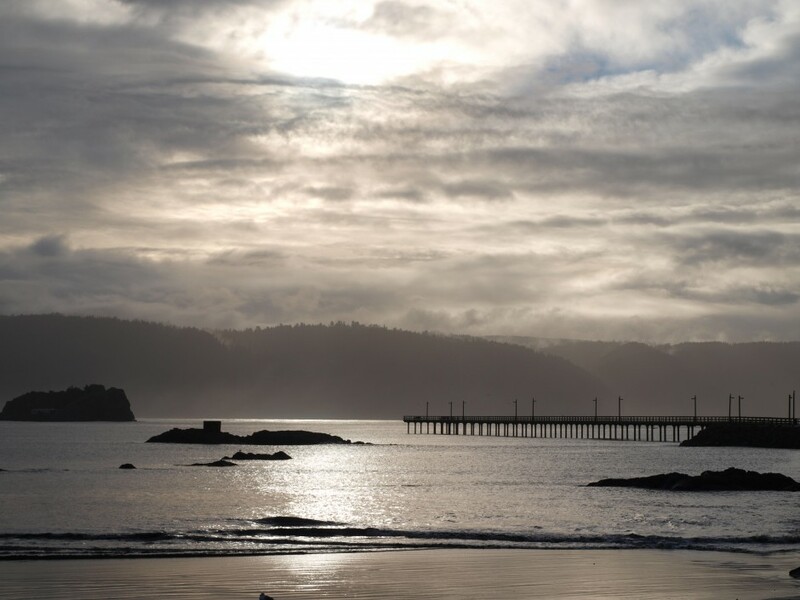 National Guard and Del Norte County Sheriff’s crews pulled the pilings to shore after they were blasted free. The pilings were attached to a winch and dragged ashore by a front-end loader, which piled them up for burning. Because the National Guard met only one weekend a month it took three months to complete the work. Plans for the new B Street Pier were completed and funding was raised for the construction. There was a $500,000 grant from the Wildlife Conservation Board, a state grant for $500,000 from an offshore oil fund, and a loan to the city for $400,000. 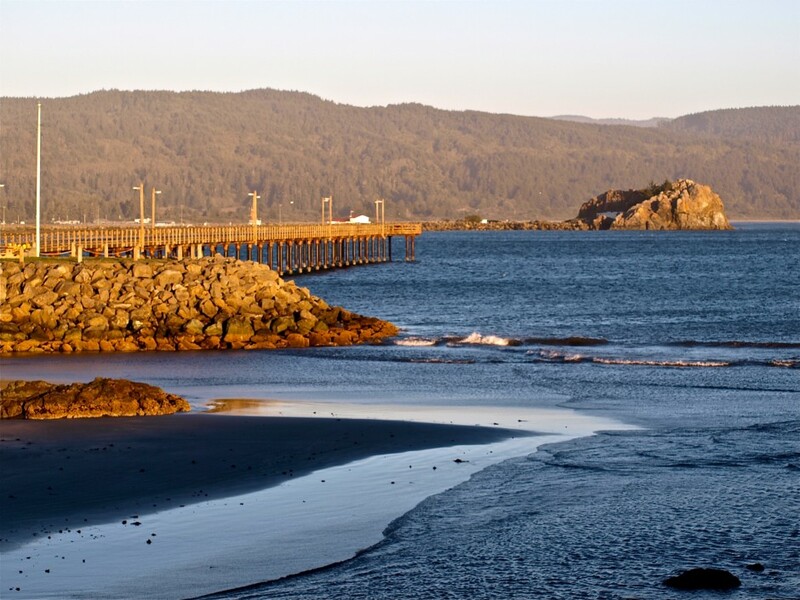 The contract for the construction of the new pier was awarded to Art Tonkin who was out of Willow Creek, Calif. The new pier was built in the same location as the old one, but at a slightly different angle into the harbor. This was perpendicular to the sand shoal pattern and reached deeper water sooner. The causeway was also widened and paved. Construction couldn’t begin until May of 1989 because of delays in shipping the steel pilings. The pilings were epoxy coated and had to be shipped from Japan. The new pier was 720 feet long and 12 feet wide. Ribbon cutting ceremonies for the new B Street Fishing Pier were held on October 14, 1989. Mayor Robert Seligman and Miss Del Norte, Severin De Gross did the actual ribbon cutting. Nearly 100 people turned out for the ceremony. Two weeks later the pier was officially opened to the public. 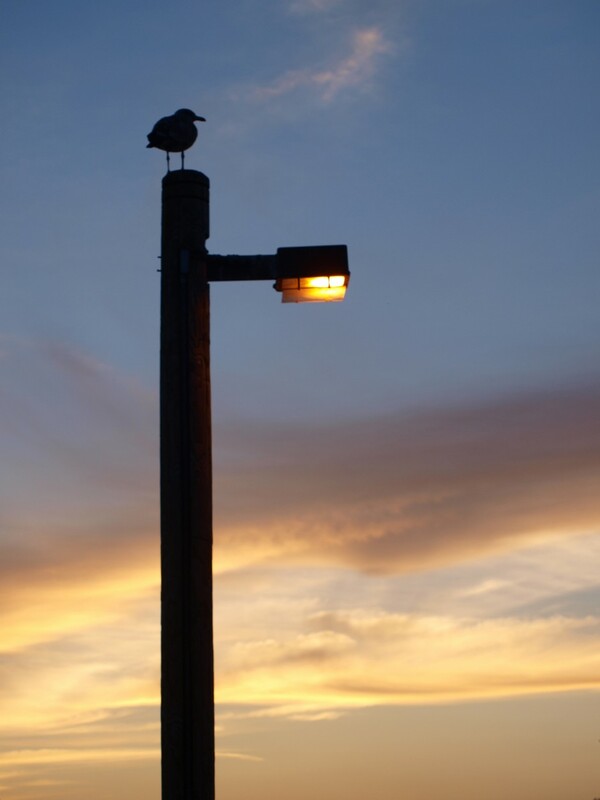 Facilities: Limited free parking at the foot of the pier, night-lights, and a few trashcans. There used to be a fish cleaning station out at the end of the pier but it’s gone—“vandals took the handles”—but there are a couple of picnic tables out at the end. The small bait and tackle shop that used to sit near the entrance has also disappeared. Thankfully, a couple of portable toilets are still present at the entrance to the pier. Handicapped Facilities: None with the exception of ramps leading up to the curb. 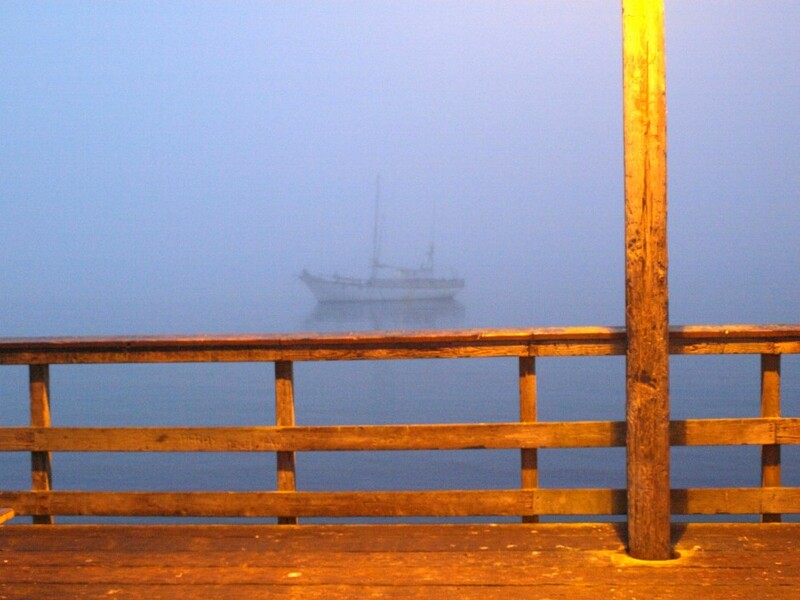 The pier’s surface is wood planks and the pier’s railing is approximately 40 inches high. How To Get there: Take Highway 101 to Front Street, go west on Front Street to “B” Street; go south (left) on “B” Street to the pier. Management: Crescent City Harbor District. Posted in California Piers and tagged with B Street Pier — Crescent City, California piers, Michael J. Scavuzzo Public Fishing Pier, Pier Fishing in California, pierfishing, saltwater fish, saltwater fishing, “B” Street Pier aka Michael J. Scavuzzo Public Fishing Pier. RSS 2.0 feed. Great story, wish you could meet up with me for 10/13, Im driving over from Medford as I am working there at Harry&David until the 19th then driving home to The Dalles. Lois, Sorry but I live in Fresno which is a very, very long day’s drive from Crescent City so I have to decline.